Do you think your child would like flushing the toilet in their new dollhouse? How about ringing the doorbell? Interactive dollhouses are a fun alternative to the typical basic dollhouse. They can expand your child’s imagination, adding different cues and ideas for role-playing ideas. For younger children, interactive dollhouses are a good way to begin teaching them sound associations, such as a barking dog. Many also include buttons that play songs, melodies, phrases, and even turn on lights. For older children, the interactive features evolve to become more complex, such as an opening garage door or a functioning elevator. These fun add-ons will allow your child to have a more immersive experience in their role-play. Either way, you’re sure to find a dollhouse you love from the best six options below. The Fisher-Price Little People Big Helpers Home is our top pick for parents looking for an interactive dollhouse for their toddler. Fisher-Price has thought of everything with this playset, and your toddler will have hours of fun playing and imagining with this dollhouse. As your young child is growing and learning, the realistic sound effects will help them begin associating sounds with certain items – such as the “flushing” toilet. This interactive dollhouse also has fun phrases and songs about teamwork. The Fisher-Price Little People Big Helpers Home is a fun educational tool for teaching your toddler how to be a “big helper”. Your child can help Emma and Jack (the two sibling dolls included with the dollhouse) wash dishes in the kitchen, clean up toys in the playroom, and even feed and water the pet dog (also included). If you’re shopping for a dollhouse that is big enough for multiple kids to play at the same time, the sides of the home swing open for more play area. The Fisher-Price Little People Big Helpers Home allows for up to three kids to play at the same time, but you’ll have sharing problems since the home only comes with two dolls. The CP Toys Toddler Interactive Discovery House Playset is a great option for parents that have limited room to put a new dollhouse. At just over 16 inches wide and 14 inches tall, even the smallest of playrooms should have a spare nook/cranny for storage. Similar to the Fisher-Price dollhouse above, this interactive dollhouse is full of buttons to press, doors to open, and object to twist and lift. Your child will love the sounds of the washing machine and turning the TV off and on. This dollhouse comes with two dolls (boy and girl) for your young toddler to role-play fun scenarios – such as snoring in the bedroom or ringing the doorbell. The small size does make it tough for multiple kids to play, but two kids should be able to play with this dollhouse at the same time. Most parents were happy with the durability and fun interactive activities the CP Toys Toddler Interactive Discovery House Playset provides to their young toddler. This interactive dollhouse is a solid purchase for young children, making it our second choice overall. The VTech Go! Go! Discovery Home is one of the top interactive dollhouses on the market today. Winner of the Parent Tested, Parent Approved Laureat Award, thousands of parents have given this dollhouse 5-star marks. The MagicPoint technology with this VTech dollhouse is industry leading. When special MagicPoint dolls are placed in certain areas around the dollhouse, your child will hear songs and sounds that seem to make the doll come to life. One MagicPoint doll (Miss Nora) is included with the VTech Go! Go! Smart Friends Discovery Home. 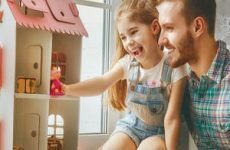 If more than one kid will be playing with this dollhouse at a time, you may want to also look at getting a Smart Friends Maddie doll for more interactive fun. 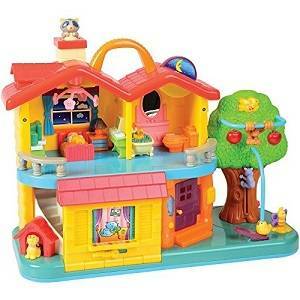 This VTech dollhouse has over 35 sounds, songs, and melodies that will encourage hours of imaginative role play with your child. The VTech Go! Go! Smart Friends Discovery Home is a fun option for children of all ages, but is really geared towards older toddlers. VTech Smart Friends provide dozens of other dolls and playsets to grow your child’s play area. For parents looking for a simpler interactive dollhouse for their toddler, the Boley American Doll House offers a nice alternative to the bigger, better-known brands. The biggest reason that this interactive dollhouse made our list is that the dolls are more realistic than other dolls for this age group. The dolls included in this dollhouse can move their arms, head, and legs, unlike the solid plastic dolls included with other playsets. The dollhouse itself does offer some fun interactive features, such as a ringing doorbell, open/close front door, and dresser drawers. It’s important to note that this dollhouse doesn’t offer as much educational interaction as other similar dollhouses. The Boley Pretend Play American Doll House is one of the best budget interactive dollhouses available. Just keep in mind that you are sacrificing some quality for the lower price tag. As you may have guessed, surprises abound everywhere on this interactive dollhouse for older children. This large dollhouse stands three feet tall, over three feet wide, and includes over 85 different surprises for your child to find. Not to give anything away, but the “surprises” in this dollhouse include furniture, pets, dolls, and other accessories. All packed up for moving day, your child will get to unpack each surprise box separately as they decorate their new dollhouse. After unpacking, your child will have fun with all of the different interactive features on this dollhouse. Some of those features include a working elevator and buttons for lights and sounds on all three levels. The L.O.L. Surprise! House is sure to be a big hit with your child. The unique “surprises” and the fun design make it our #1 interactive dollhouse for kids six years and older. Surprisingly to some, the Barbie Dreamhouse actually offers a ton of different interactive activities for your child. Many of the 70+ accessories included with this dollhouse are “smart”, meaning that they’ll interact with other furniture pieces (such as aquarium with swimming fish and bubble sounds). The Barbie Dreamhouse has seven different rooms over three total floors, offering many fun features such as a pool, built-in garage, and even a working elevator. Your daughter’s Barbies will make themselves right at home in this interactive dollhouse. The Barbie Dreamhouse is one of the biggest dollhouses out there, so make sure you space in your child’s playroom before ordering. The overall dimensions are 4 feet tall x over 3 feet wide x almost 1 foot deep. If you have the room at home, your child will love the fun scenarios she imagines for her Barbies in their new Dreamhouse. The price tag is a little steep for some, but is a great interactive dollhouse for older children. You can read our full Barbie Dreamhouse review here. 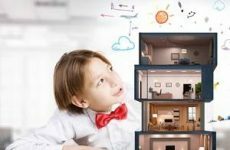 It’s important to remember that every child is unique, and the perfect interactive dollhouse for them may be one from a different age bracket. If you couldn’t find an interactive dollhouse in our list of favorites above, there may still be hope. Click here for an extensive list of interactive dollhouses for your child.